The sleeve of 'Sweetest child' states 'featuring Maria McKee', but since no other artist is mentioned, I always take this simply as a song by her. And indeed, it was written by McKee with Brody and Glover, so my assumption should be correct. The other assumption I made when this single came out, was that it would be a hit. I wasn't right in that respect: the single flopped in the territories I know about. Still, it is a nice song and there is no real explanation for its lack of success. Maria Louise McKee was born on August 17, 1964 in Los Angeles, California. She was a founding member of the band Lone Justice in 1982. When she was 19, she wrote 'A good heart', which became a hit for Feargal Sharkey in 1985. Her debut solo album appeared in 1989. 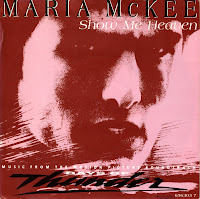 A year later, she recorded 'Show me heaven' for the soundtrack of the movie 'Days of Thunder'. Originally written by Joshua Rifkin and Eric Rankin, when McKee was first offered the song, she refused to record it unless she was allowed to change the lyrics. The single turned out to be a massive success for her, peaking at number 1 in the UK and the Netherlands.